Free Passport Trial at the Summer Sidewalk Sale! Stop by the 1800 Baskets.com big summer sale! Shop for amazing gifts at 30% off and get a free Passport® trial at the Summer Sidewalk Sale! 3 Days left to save! Take 30% off a beautiful selection of gifts. Thoughtful treats, gourmet edibles and gift baskets now on sale. Shop and use the promocode DOW30 at check out. Don’t miss beautiful handcrafted baskets, scrumptious treats, lovingly made spa gifts and adorable baby gifts on your trip to the sidewalk sale. Thanks for stopping by! Enjoy a Free Passport Trial! 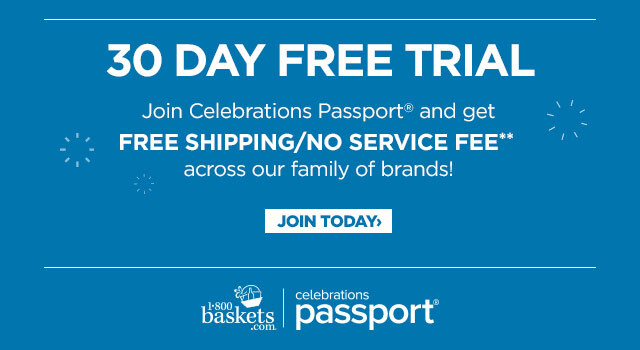 We’re celebrating summer with a 30 Day Free Trial to Celebrations Passport®. Get free shipping/no service fees across our family of brands! Sign Up Here for a Free 30 Day Trial! Summer Fun Sweet vs Savory Showdown! Summer barbecues and parties just wouldn’t be the same without a variety of snacks and treats to keep the crowd happy! While some of us look forward to the creamy savory cheeses and salty snacks, others can’t wait for the grand finale–the dessert table! There’s no right answer but you can cast your vote — We’re holding a Summer Fun Sweet vs Savory Showdown starting 7/11/16. Sign up here: Sweet vs Savory Sweepstakes! Root for your favorite! Sweet vs Savory. It’s a Sweepstakes too! You could win a beautiful summer gift from 1800Baskets.com brimming with mouthwatering sweets or savories. The 1800Baskets.com Sweepstakes runs July 11 to August 1. Don’t miss the fun! Need a gift for a summer occasion? Try these in-season favorites! Dana’s Bakery Macarons and Savory Gourmet Snack Basket are wonderful gifts for a summer birthday, thank you or to wish them congratulations. For more gift ideas visit our Summer Collection! Anchors Away for Father’s Day! Anchors Away Winners! Bonnie W. Hope to win the Fisherman Basket, Annette P. A day that’s bluer than blue yet not blue at all, Tammy K. Best Day Ever! Congratulations to everyone who participated in the Sweepstakes. This promotion is now over. Fans, you can use the Promocode 20DEALS for a summer sitewide sale at 1800Baskets.com! Smooth sailing and clear skies are in the forecast for a new Father’s Day Sweepstakes: Anchors Away For Father’s Day! The 1800Baskets.com Facebook photo caption Sweepstakes is under way!! Father’s Day is a great time to celebrate dads for all their love and support throughout the year. Let your dad — hero, guide and captain of the ship know how much you appreciate him with an amazing basket of treats. Enter the 1800Baskets.com Sweepstakes and you could be the winner of one of three Father’s Day gifts. Is your dad a fisherman? 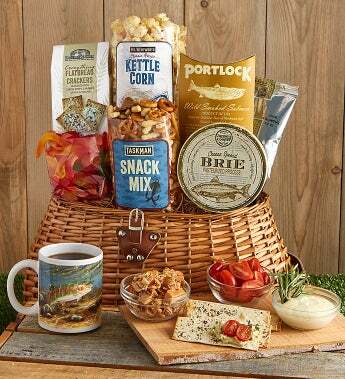 One of the prizes, Fisherman’s Favorite Snacks, is a fishing basket brimming with savories and sweets your dad is sure to enjoy. Happy Father’s Day Everyone! Anchors Away! Win a prize for your dad! ENTRYPERIOD: 1-800-BASKETS.COM® 2016 Anchors Away for Father’s Day Sweepstakes (hereinafter the “Sweepstakes”) begins at 8:00 PM EDT on 6/2/16 and ends at 11:59 PM EDT on 6/13/16 (the “Entry Period”). 3. SWEEPSTAKESPRIZES AND APPROXIMATE RETAIL VALUES (“ARV”): Three (3) Prizesin total will be awarded. Winners will be randomly selected and will receive one (1) of the three following prizes. A 1-800-BASKETS.COM® Classic Barbeque Gift Tub (product code #149456) ARV $59.99 USD, 1-800-BASKETS.COM® Father’s Day Tie-rrific Tower (product code #149453) ARV $49.99 USD or a 1-800-BASKECOM® Fisherman’s Favorite (product code #149454). Total ARV of all prizes of $169.97 USD. WINNER SELECTION: Winners will be selected on or about June 15, 2016in a random drawing from among all eligible entries received during the Entry Period by a representative of Sponsor, whose decisions are final on all matters relating to this Sweepstakes. Odds of winning depend upon the number of eligible entries received during the EntryPeriod. Prizes will be awarded and potential winners will be notified by email associated with their Facebook account. Prizes are nontransferable and no cash substitution is allowed except by the Sponsor, who reserves the right to award prize of equal or greater value if advertised prize is unavailable. 5. GENERAL RULES: Taxes, related to the prizes are the winners’ sole responsibility, if applicable. Prize winners may be required to execute and return an affidavit of eligibility and liability/publicity release (where legal) within five (5) days of notification attempt or prize will be forfeited and an alternate winner selected. Return of any prize or prize notification as undeliverable may result in disqualification and alternate selection. Acceptance of prize constitutes permission to use winner’s name, likeness, image, photo, sobriquet and biographical information for promotional purposes without further compensation except where prohibited by law. By entering, entrant accepts and agrees to be bound by these OFFICIAL RULES and winners release Sponsor, and their subsidiaries, affiliates, directors, officers, employees, agents and all others associated with the development and execution of the Sweepstakesfrom any and all liability for damages, losses or injury resulting from participation in the Sweepstakesor acceptance or use of prize. Entries will be declared to be made by the authorized account. “Authorized account holder” is defined as the natural person who is assigned to the Facebook account associated with the submitted Entry. Entries are subject to verification of eligibility and will be declared invalid if they are incomplete, falsified, altered or tampered with in any way. Sponsor reserves the right in its sole discretion to disqualify any individual that tampers or attempts to tamper with the entry process or the operation of the Sweepstakes or website; violates the OFFICIAL RULES; or acts in an unsportsmanlike, obscene or disruptive manner, or with intent to annoy, abuse, threaten or harass any other Entrant or person. Sponsor and its agencies are not responsible for lost, late, incomplete, misdirected or damaged Entries due to internet services providers service, weather, technical, hardware or software malfunctions, telephone failures of any kind, lost or unavailable network connections, or failed, incorrect, inaccurate, incomplete, garbled or delayed electronic communications, whether caused by the sender, by any of the equipment or programming associated with or utilized in this Sweepstakes which may limit the ability to participate, or by any human error which may occur in the processing of the Entries in this Sweepstakes. Sponsor reserves the right to cancel, terminate or modify the Sweepstakes if it is not capable of completion as planned, including for infection by computer virus, bugs, tampering, unauthorized intervention or technical failures or corruption of any sort, and award prizes from eligible Entries received prior to cancellation. Void where prohibited or restricted by law. 6. ELIGIBILITY: This Sweepstakesis open only to legal residents of the 50 United States, including the District of Columbia, who are 21years of age or older as of date of entry who have or open an account on Facebook.com. Accounts at Fcom are free and can be opened at www.facebook.com. All federal, state, and local laws and regulations apply. Employees and families of 800-Flowers, Inc. (“Sponsor”) their subsidiaries, divisions, affiliates and related companies, advertising and promotion agencies, and their immediate families are ineligible. 7. WINNERS LIST: For the names of the winners, visithttps://www.facebook.com/1800basketsand refer to the “Notes” section from approximately 6/20/2016 through 7/20/2016. 10. GOVERNING LAW & VENUE: THE NEW YORK COURTS (STATE & FEDERAL) SHALL HAVE SOLE JURISDICTION OF ANY CONTROVERSIES REGARDING THE SWEEPSTAKESAND THE LAWS OF THE STATE OF NEW YORK SHALL GOVERN THE SAME. EACH ENTRANT WAIVES ANY AND ALL OBJECTIONS TO JURISDICTION AND HEREBY IRREVOCABLY SUBMITS TO THE VENUE OF THOSE COURTS WITHIN THE COUNTIES OF NASSAU AND SUFFOLK COUNTY, NEW YORK. Charlotte, Can you help me find the perfect gift for the bride-to-be? You bet, and… have some fun while you shop! Sign up for our Shopping Sweepstakes, Charlotte, She’s Engaged! This promotion is now over. The winners are listed below. Thank you for participating in Charlotte She’s Engaged! Charlotte, our personal shopper can help you find a gift for the bride-to-be! The 1800Baskets.com Sweepstakes and Shopping Tool starts June 13, 2016 to June 28, 2016. No purchase required to enter Sweepstakes nor will it increase your chances of winning. Wedding season is here! You may have friends and family members on your list for engagement, bridal shower and wedding gifts. Pressed for time? Charlotte can help you find an amazing gift and make shopping a breeze. Is the bride-to-be a country girl, a spa girl or does she adore chocolate? From our Congratulations Collection Charlotte will find you a gift the bride-to-be will love. Here’s the fun part! A little something for you too. Enter our Shopping Sweepstakes and you could win one of three beautiful gifts from 1800Baskets.com! Good luck! Sign up today for Charlotte, She’s Engaged! Thank you fans for participating in the sweepstakes! We hope you found some great gift ideas and that you had as much fun as we did! Here is a sitewide promocode you can use at www.1800baskets.com: SPA20. Hooray! After years of hard work and determination, they finally did it! Help your grad savor his shining moment with delightful desserts that hold the promise of an even sweeter future. Here are five graduation gift ideas that every grad will love. Hats off to the grad! To celebrate the big day, these one-of-a-kind cookies arrive in a box shaped like a real graduation cap. Inside, the mortarboard is filled with Oreos—everyone’s favorite classic cookie—hand-dipped in real chocolate and decorated with diplomas and other grad-themed trimmings. It also comes with a personalized message with special kudos straight from you. Sure, your graduate could share the delicious cookies with the rest of the graduating class … but he won’t want to! Graduation day is only the beginning of the lifetime of success that waits ahead. Show your alum how proud you are of today’s accomplishments—and give him your best wishes for a bright tomorrow—with this colossal fortune cookie! This treat is as yummy as it is gigantic: It’s hand-dipped in Belgian dark chocolate and then decorated with a graduation cap and their commencement year. The cookie even has a customizable fortune inside and comes in a cute takeout carton. This grad’s future is looking good! Show the grad how to take a delicious slice out of life with this mouthwatering pie. Each handcrafted pastry is made with a rich, buttery cookie crust, smooth and sweet white crème, and Oreo pieces sprinkled on top. Then, it’s all wrapped up in a metallic gold gift box and a “Class of 2013” ribbon—perfectly sophisticated and festive packaging for the occasion. One pie can serve up to 12, but don’t be surprised if your grad wants it all to himself. After all, graduation is all about seizing great new opportunities! After so many years of bringing bright red apples as a gift for the teacher, it’s time to reward the student with a special apple of his own. Weighing in at over 1 pound, this tart, juicy orchard-fresh Granny Smith is dipped in creamy caramel, sprinkled with rainbow candy and drizzled with white confection. We top off the treat with some pretty ribbon and a heartfelt note. There’s no sweeter way to say congratulations for a job well done! Once that cap has been tossed into the air and that diploma is in hand, it’s time to party! This Popcorn Factory sampler holds an entire graduation bash in a box: It has everything your graduate and his fellow alums need to let loose after school’s out for good, including gourmet cheese, white cheddar and caramel popcorn; mini pecan-caramel Pixies; honey-roasted peanuts; popcorn balls; Jelly Belly jellybeans; sour stars; and milk chocolate-covered pretzels. A well-earned treat for a hardworking grad! Which gift will you give to your grad to sweeten his commencement day? Welcome back gift basket readers! How much have you all loved the Olympics? This and Lost on Netflix have been the only programs on my television for the last week. And there is so much more we can talk about! But first, let’s get to the “award ceremony” of our post first and send out some gift baskets! Congratulations to Marie Leclerc (July 27, 2012 at 3:13 pm), Jessica (July 27, 2012 at 6:48 pm), Melanie T (July 27, 2012 at 7:24 pm), Jill H (July 31, 2012 at 7:45 pm), and Joy (August 1, 2012 at 1:04 pm)! Send your information to me at amariscal@1800flowers.com and I’ll send out an award winning treat! Now back to Olympics! Like I said before, I’m normally a very avid watcher who sometimes gets a case of the “why-didn’t-my-parents-train-me-in-some-random-event-since-I-was-2-itis”. I thought I would be more passive in my viewing this year, but watching people balance themselves on a bar using only one hand or swimming faster than I can drive my car has left me feeling a little more motivated to get out there and exercise, eat healthier and at least attempt to organize my life. So far I’ve added a bit more fruit and vegetables to my daily nutrition and the occasional workout. We always think that our healthy routines will be easy to maintain, and for a while they are! It’s only when you get to a time of celebration that you take that tiny step and end up falling down into excuses and extremely delicious cookies. Which is why I want to applaud who ever made it okay to send out healthy gifts that promote clean living! Fruit gift baskets for all I say! Put together some ripe apples, juicy oranges, maybe some almonds, cashews, and fresh cheese, and you have a gourmet gift basket ready to be enjoyed and without any guilt. Believe me; I love sweets and chocolates as much as the next person, but sometimes you need a fresh break (and maybe some inspiration from an exceptional fruit basket). If you have a friend you know is trying to keep healthy or maybe you’re tired of receiving tempting sweets for all of your celebrations, look to our amazing fruit baskets and healthier gift basket options! 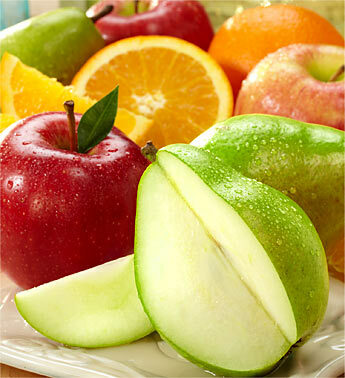 We offer the freshest fruits, nuts and assortments all delivered right to your door. Our fruit baskets are great for picnics, healthy snacks, or a great way to brighten someone’s day. We’re also entering marathon season! I know our healthy fruit and gift baskets would be enjoyed by any running or biker training for their races. I want to hear from all of you, in the comments section (1-2 paragraphs) tell me what you would put in your own fruit gift basket or how you like to keep healthy! Five lucky commenters will win a fruit gift of their own. Look forward to your responses, have a great week! Everyone loves chocolate covered strawberries, especially when they’re so seasonally decorated in the good red, white and blue! Our Stars & Stripes Chocolate Covered Strawberries are an absolutely decadent treat that will have you feeling more patriotic with every sweet bite. Fresh-picked and ripe strawberries are hand-dipped in and festively decorated to perfection. 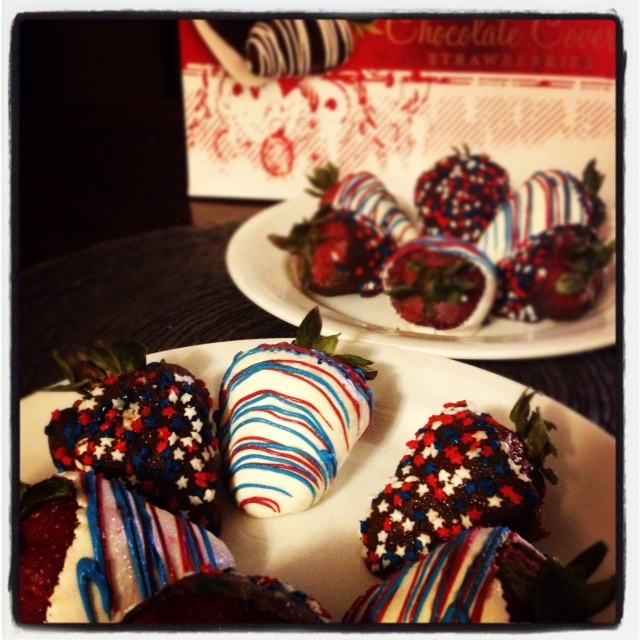 You’ll receive six strawberries hand-dipped in dark chocolate and decorated with red, white and blue candy stars. As well as six large strawberries hand-dipped in white confection and drizzled with patriotic red, white and blue confectionary designs. I loved these decadent berries and felt a lot less guilty eating so many of the dark chocolate covered strawberries, convincing myself that since it’s dark chocolate it would be okay! I have no excuse for the white confection strawberries other than they were too delicious to resist and I wish I had about 20 more of them. I currently have a few freezing to enjoy later, they end up tasting like a strawberry chocolate smoothie. With Fourth of July coming up soon, these chocolate covered strawberries would be perfect for a Fourth of July party dessert or a great party prize. Be sure to send these to any military relatives and families you know to celebrate the season, or just order some as a great treat to snack on with you and your family on your way to see 4th of July fireworks! Orders come in 6 or 12 chocolate covered strawberries and require overnight delivery. This Patriotic Caramel Apple from 1800Baskets.com is one of my absolute favorite summertime gifts to share with you all! With Fourth of July just around the corner, you need something festive and delicious to display at your patriotic bash. 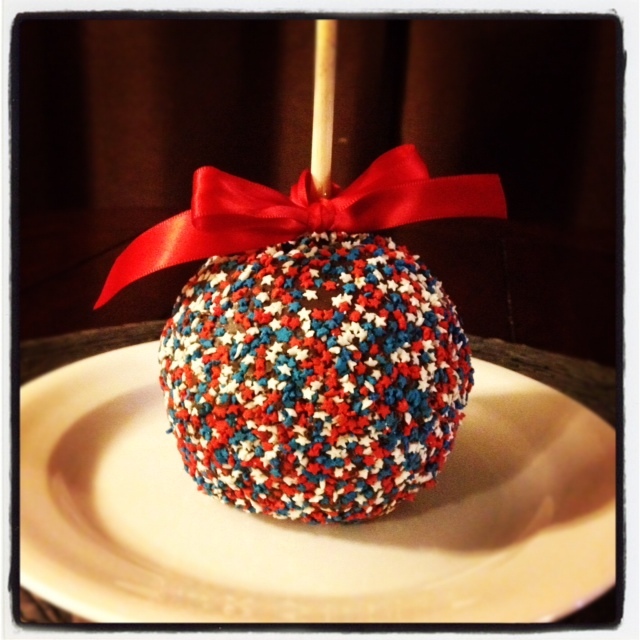 This candy apple gift screams red, white, and blue in a delicious way! Every order comes with a large and tart Granny Smith apple which is hand dipped in rich, gooey caramel and covered with dark chocolate; if that weren’t enough, it’s sprinkled with red, white and blue star sprinkles and then tied with a festive red bow for finish. These candy caramel apples would be great to use for a table centerpiece or to give out as a party game prize for your patriotic guests. I could see this as a cute “just because gift” for a friend or coworker. If you have a sharp knife, you could cut this apple to be more shareable. I was sharing this with family and sliced into more bite size pieces for easier enjoyment of this super rich tasting dessert. I would have put pictures, but I couldn’t keep everyone away from it fast enough! Whichever way you decide, I know you’ll enjoy this great summer gift!